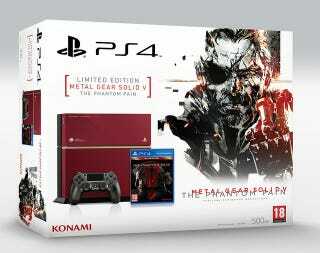 Are you envious of the MGSV LE PS4 coming out in Japan? Well, no more, if you live in Europe. You can now own it. This exclusive bundle will include a limited edition 500GB PS4 that comes in a distinctive deep red with gold line detail, inspired by the look of Snake’s Bionic Arm. A special metallic grey Dualshock 4 Wireless Controller, resembling the handgun held by Snake, is also included and both the PS4 and Dualshock 4 feature the unit emblem of Diamond Dogs, a private military organisation led by Snake. You’ll also receive the Day 1 Edition of Metal Gear Solid V: The Phantom Pain which comes packed with bonus downloadable content.